A right-back, Riley became Argyle's fourth summer signing in as many days in early June 2018. Born in Salford, he began his career at Bolton Wanderers, but made only nine first team appearances, although three were in the Premier League, including a substitute appearance at boyhood favourites Manchester United at Old Trafford. Unfortunately, his progress was hampered by a succession of injuries. A broken foot put paid to much of his second season at Bolton and he missed all of the 2013-14 campaign with knee ligament damage sustained in pre-season. To aid his recovery, Riley enjoyed a productive loan spell at Oxford United in the first half of the 2014-15 campaign, making 28 appearances without scoring. On his return, Bolton allowed him to join Bury on a free transfer. He went on to make 57 appearances and score twice in 18 months for the Shakers, before moving on to Shrewsbury Town in the summer of 2016 on a two-year deal. Ever-present in the early part of the 2016–17 season, his match time was then restricted by a knee operation in October, a hamstring injury in February and ligament damage and a broken fibula in the final match of the season. After recovering from his leg break, Riley returned to the side in August 2017 and played his part in the Shrews' push for promotion. In total he scored three times in 55 games for the club, including a substitute appearance in Shrewsbury's unsuccessful 2018 Play-off Final at Wembley Stadium. 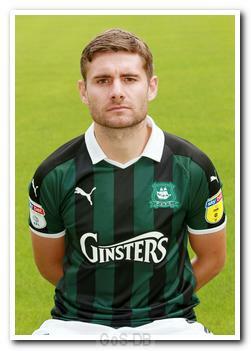 He was released by Shrewsbury at the end of the 2017–18 season, enabling his move to Home Park, which he heard about on his wedding day.